Trinket Sew Along – I’m In! The Trinket Sew Along starts this Sunday with the first block posts happening on Monday. Clinton Modern Creative is a sponsor of the sew along and has gathered a few Canadian bloggers to sew and blog along. Pictured below is the stack of Alison Glass fabrics I will be sewing with. I haven’t fully decided on my final layout but I may make my blocks into two pillow covers. There are some great prizes and discounts coming in the sew along plus it’s going to be fun with over 1000 people signed up. Well, I survived my gallbladder surgery last Friday so you haven’t got rid of me yet. 😉 I am a fast healer so I have been back at my sewing machine already although not for as long as I’d like. Have you been sewing along in the Harry Potter Quilt Along? I only have the first two blocks done but I am very happy with them. Cupboard Under the Stairs Block designed by Kelli Fannin. Pieced by Daydreams of Quilts. 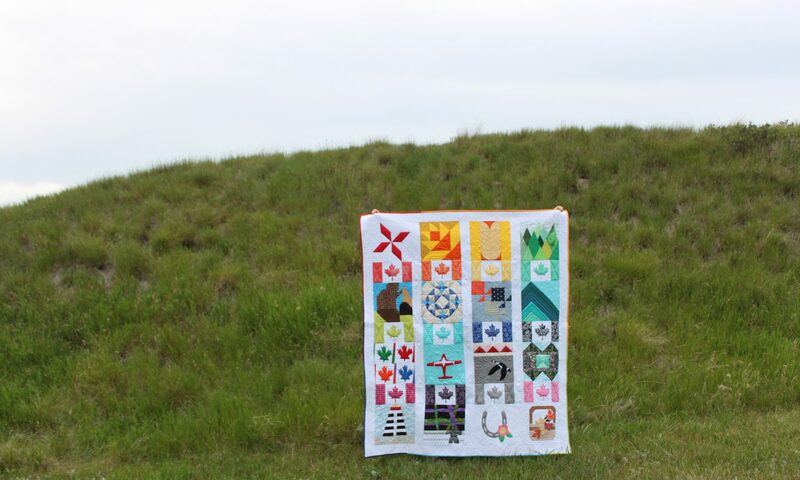 I have been eyeing the Meadowland Quilt for some time and since the pattern is currently on sale ahead of the upcoming Meadowland Quilt Along I decided to buy it. Now I need to pick fabrics because the quilt along starts Monday! Maybe Heather Ross fabrics? There are some good fussy cutting opportunities here. The Trinket Sew Along is starting March 10th with Alison Glass. Daydreams of Quilts has been partially sponsored for this sew along by Clinton Modern Creative and I will be sewing along and blogging during some of the weeks as well. Clinton Modern Creative has fat eighth bundles and fat quarter bundlescurated for this sew along and is also a sew along sponsor. This year I will be releasing quilt block patterns. The first in my spring series is out already. The bunny block with a carrot block and bonus Easter egg block. For our Handmade Customers: I have made several new cork wallets in the past few weeks and glitzy evening bags are coming soon in March. We have also brought back our popular personalized initial pillows which are upgraded with blanket stitching around the applique and zipper back closures. For Easter we have added personalized Easter Baskets to the shop as well as some stuffed carrot decorations. What’s New So Far for 2019? Happy 2019! I’ve had a good break the past few weeks and am feeling refreshed. How is your new year going so far? I resolved to cut back on our plastic use this year. So far I am off to a great start! I have brought in reusable stainless steel straw sets to both our home and our online shop. I have also brought in reusable mesh produce bags as well and I’ve been using reusable grocery bags for a couple of years now. I must say, I have a great sense of pride when I’m buying my green peppers and tomatoes and I pull out my drawstring bag full of mesh produce bags. The kids are proud too and the stainless steel straws are a hit. My kids are very concerned about the environment and animal welfare. Straw Set at Daydreams of Quilts on Etsy. I have been using small sample pieces of cork and fabrics that have been long-time residents of my sewing room and created 13 cork bottomed zipper pouches on a three day sewing spree! This weekend I tried out the Metro Double Zip pouch pattern by Sew Sweetness which is this month’s Minikins Challenge bag. I have made three so far (one is pictured below) with three more cut out. These are available to purchase in my shop. I bought Minikins Season 2 with Christmas money from my father-in-law and there are several great patterns in there. I have one of the wallets cut out too. The Harry Potter Sew Along starts this week on Kelli Fannin’s Blog called Seriously I Think It Needs Stitches. Being a huge Harry Potter fan I am very excited for this as are my kids. I am so happy Kelli is doing this because I was thinking of it but now I can just participate and have fun. She is teaming up with Lorna from Sew Fresh Quilts who is also running a Harry Potter Sew Along at the same time. Kelli brought us the Minecraft Quilt Along a couple of years ago and my daughter is really on my case to finish that quilt. I have just one more block to sew so that is my goal for today. I have been checking off goals and have opened two new Etsy shops! Rainbow Button Hair bow at It Snows Bows. Pancakes and Maple Syrup card at Anita Loves Paper on Etsy. Two Weeks Left to Shop our Clearance Sale and What’s next? Hello! I hope this message finds you well. I am popping in today to give you an idea of what’s happening with Daydreams of Quilts and what direction we are moving towards in 2019. Digital Patterns will continue to be available on Etsy and Craftsy. We have learned so much this year and visited with some fantastic makers at the Etsy pop-ups. Those lovely ladies were so kind to share some insights into their businesses with me and it became very clear that we need to change our business model. I am happy to answer any questions you have if you are interested in that. Just shoot me an email or message me through the contact form on the home page. I will be taking it more slowly for the next few months as I have a surgery (gall bladder) coming up but watch for new and different things happening with Daydreams of Quilts in 2019. Newsletter subscribers and blog readers will be the first to hear any news. We are discontinuing quilting supplies and handmade quilts, bags and wallets but have many different ideas for products and possibly even a whole new business. Christmas Stockings will come back seasonally. We are definitely looking to environmentally friendly choices in our approach going forward. I do have more quilt pattern designs in the works as well. The blog will continue but at a slower pace over the next few months. It has been a pleasure to serve the quilting community. I wish to thank all of you who have supported my business, my family and myself so much. You have been wonderful! We have one last show coming up this weekend for Daydreams of Quilts. We will be at the Made in Alberta show at the Shaw Conference Centre in Edmonton, Alberta this weekend. I hope you will stop by and say “Hi” if you come. Thank you again for your support this year and have a wonderful Holiday Season! Well! The news was interesting today wasn’t it? I checked my phone while brewing my coffee first thing this morning and was immediately intrigued by the Banksy story. I am a fan of his art and so I immediately clicked in to read. I was fascinated all day and then when he posted a video on his Instagram account I decided that I had to make a mini quilt and destroy it in admiration and tribute. Then, with my iPhone on a holder and with my rotary cutter and shaking hands I cut up the mini quilt! See the video below on my YouTube channel. All in all… a creative and fun day!